Two boys learn from a mysterious warrior that they are the heirs to the throne of Patusan and set out to overthrow the current monarchy. 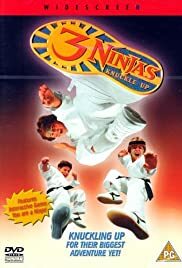 Stars: Ernie Reyes Sr., Rob Schneider, Ernie Reyes Jr.
Grandpa: People can't fly, but ninjas can! Part Crouching Tiger, Part Surf Ninjas, this rollercoaster ride gets Three Knuckles up!